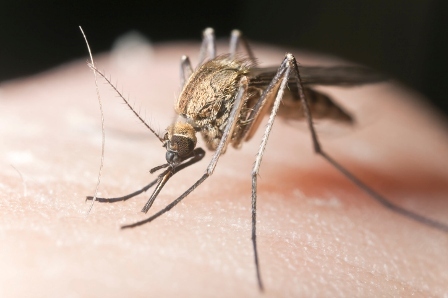 The study combined simulations of mosquito biting rates and malaria transmission rates with a detailed regional climate model, to predict changes in the pattern of malaria infection across a large area of Africa up to 2050. The spread of malaria is predicted to decrease over most parts of tropical Africa because of likely increases in surface temperatures and reduced rainfall. But epidemics are projected to move south in the sub-Saharan Sahel region, and in much of East Africa transmission rates of the disease are likely to increase. In particular the study highlighted the sensitivity of upland areas, where a change of just 2°C could put previously malaria-free regions at risk of epidemics. Malaria flourishes in warm, humid environments, so surface temperature and rainfall are the two most important natural factors that influence where it will strike and how quickly it’s likely to spread. The combined weather-disease model showed how temperature and rainfall might change under two climate scenarios using different levels of greenhouse-gas emissions, and also with likely changes to land-use – for example when forests are cleared to make way for crops. The human effects on climate through land-use change are ignored by many climate models. But they can have a significant effect on local climate – clearing land of natural vegetation, for example, causes local temperature to rise and reduces rainfall. The model predicts changes in both the geographic occurrence of malaria and the intensity of transmission. When a malaria epidemic strikes it is in an area where people have low immunity and the disease is more likely to affect people of all ages. So knowing what areas might become at risk in future would make prevention and treatment more effective. Though it’s unrealistic to target malaria treatment programmes as far ahead as 2050, these long-term predictions would be useful for strategic land-use planning, for example where governments are considering developing particular areas or where populations are shifting from rural to urban centres. One of the benefits of modelling trends at such a small scale is that the researchers can start to narrow down the timescales within which malaria infection patterns could change in particular areas, rather than making general statements. So the next step is to identify which altitude ranges or lowland areas are likely to be affected in a particular ten-year window – information which will be much easier for decision-makers to work with. The researchers emphasise that other variables not included in this study, like improved prevention and treatment, might in practice counteract the effects of climate on malaria infection. Indirect effects of climate change on malaria might be important too; for example the effects of a warming climate on agriculture might cause people to migrate to urban areas, and this would affect transmission rates.